Today the UN General Assembly condemned Israel while failing to condemn Hamas due to procedural obstacles. 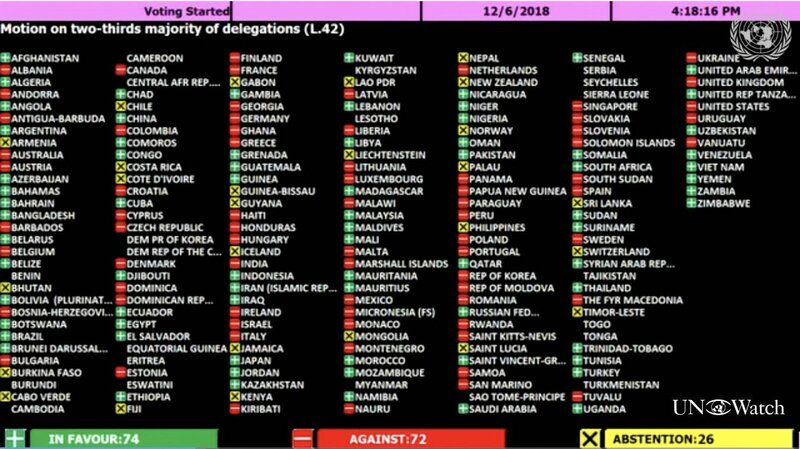 For the full chart of the 20 UNGA country condemnations being adopted in November/December 2018, please click here. 1. “Activities of Hamas and other militant groups in Gaza” [A/73/L.42]: Rejected by a vote of 87 – 57 – 33. Two-thirds majority was required. 2. “Comprehensive, just and lasting peace in the Middle East” [A/73/L.49]: Adopted by a vote of 156 – 6 – 12.